I completely forgot to update my blog when I released Reluctant Godmother #2! How silly of me. I’m insanely proud of this book. My copyeditor, the wonderful Katie St. John-Shin, raved about it as she read it. My dad texted me this morning to let me know he’s halfway done, and wanted nothing more than to tell everyone he meets about it (except that he’s a trucker, and that talking to other truckers about fairy godmothers would be, shall we say, awkward). Oh, the warm fuzzies that brings! The weft and wend of this story…it has so many threads to pull together, I often despaired I would do a clumsy job of it. I worried through the entire two years that I wouldn’t be able to pull off what I had planned. It tried many times to spiral out of control, to grow steadily larger until it finally topped out at about 180,000 words (pre-edits). I had pulled apart the structure of the first act so many times, I couldn’t remember what was where as I was writing the second half. For most of the final haul, I felt like I was flying blind. Had I left that part in? Did I mention this thing earlier? What was I forgetting? Was this character a jerk the whole time, or had I written it to gradually build confusion? The day my mom finished reading the first book and asked me if we’d find out about what was going on at the end in the next book, I about gave up (how was I supposed to write a decent sequel when I could barely remember the beginning of the second, let alone the ending of the first?!). Thankfully, I didn’t. Because none of that is why I’m so proud of this book. I started writing A Wand a Day in September of 2016 and finished almost exactly two years later, in September of 2018. Going back over my productivity tracker, I would write a few thousand words…then put it down for a month. Write a few thousand words, put it down for a month. And it’s no wonder. I got tremendously sick for two months in the spring of 2017. When I was finally feeling better, my mom ended up in the hospital. Then my son got sick. Then my husband needed a bone marrow biopsy. Then my cousin spent a month in a medically-induced coma. Then I got sick again. 2017 was not a great year. 2018 opened with tremendous stress, culminating in a sudden move to California in April. By the end of the summer, I was sick again, this time with breathing issues we’re still trying to figure out six months later. So, healthwise, it’s been a rough road. My stubborn refusal to let the book go is the only reason it’s available now. But more than that, this book saw me through a complete transformation of self. If One Good Wand was hard to write because it dredged up all my insecurities, past troubles, and unresolved feelings, A Wand a Day nearly did me in. In the course of the last two years, I lost both of my muses to interpersonal complications. Given that their likenesses form important parts of Tessa’s world, writing became a study in constant heartache. The Chisel’s behavior became a frustrating parallel that made me want to collapse on the keyboard every time he appeared on the page. Mueller wouldn’t talk to Tessa until last August, when I finally figured out a reason for his reticence. (Yes–August, in the last 30,000 words of the novel. Fixing their interactions was a whole edit in and of itself.) I no longer have my alpha reader and sounding board, either. So Tessa’s struggle throughout the book to hold onto a life that makes sense mirrored my own losses and fears (ironic, since I had planned her life that way in 2015). And that was the hardest thing I’ve ever put into a story, bar none. And so I present The Reluctant Godmother’s second adventure, A Wand a Day. Give it a read if you’ve read her first, and if you haven’t, you can snag that on Amazon for 99 cents. beehives, and responsibilities that go with it. In fact, all she wants is a paycheck that pays the bills and gets her back on her feet in the Mundane world. Unfortunately for Tessa, magic has other plans. One way or the other, she’s going to have to make a choice – Light or Dark, Magic or Mundane – before the beasts that prowl the woods and boardrooms of Colorado decide her future for her. Tessa Hargitay’s life has all the makings of a perfect fairytale: A woman out of hope and out of luck; a perfect, blood-red rose; the return of a childhood crush as a handsome, charming prince-of-a-man. Except for Tessa, it’s not your run-of-the-mill happily ever after. In fact, it’s not a fairytale ending at all. With one unwary signature, she finds herself caught up on the other side of the tale–the side full of responsibility and dire consequences, and none of the rewards. Tricked into becoming a fairy godmother, she has one shot to save the people of Denver (and her mom) from a coma-inducing sleeping curse. Unfortunately, her mentor has vanished, the Fairy Folk are too wrapped up in red tape to be of use, and her only ally is a growly machine tech who’s as human as she is. With no training and only vague sayings to guide her, it’s a prickly briar path Tessa isn’t entirely sure she wants to take. But then, if there’s anyone who could get Cinderella to Comic Con on time, it’s gotta be a geek with a magic wand, right? Tags: dramedy, fairy tale, new book! 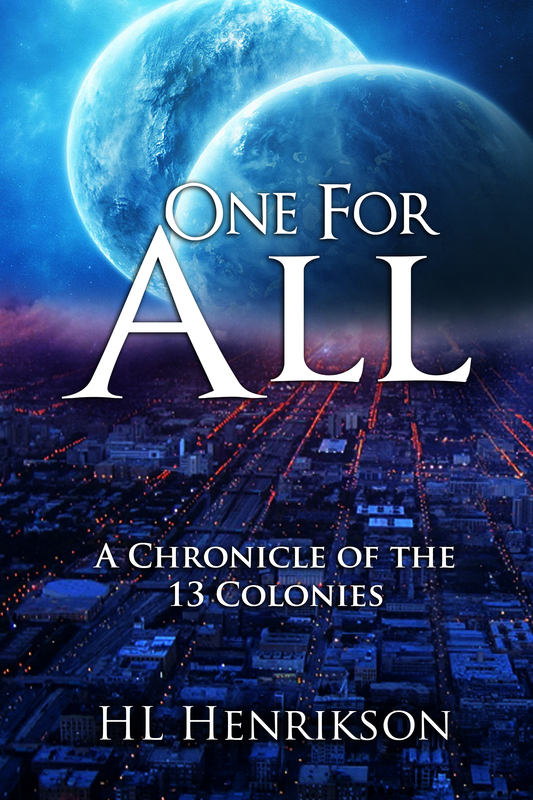 Release Day: One For All! The first novella in my Chronicles of the 13 Colonies series is out now! When Talbot joined the top secret Agency to protect the welfare of Colony 3’s citizens, he dreamed of crushing the criminal element running her streets to pave the way for class equality. Now, several decades and countless apprentices later, social degradation continues as if his hard work meant nothing. Life may be beautiful in the skyrises, but between the neon and the gutter, drugs, gangs, and violence rule all. He’s about ready to call it a wash and retire to one of the colony’s sprawling vignards when a routine trip to his favorite watering hole puts him on the scene – and in the way – of a high profile murder. With the limelight shining holes in his cultivated anonymity and his intuition counting down the days to something big and dark and dangerous, the last thing he expects to find is a new protégé. The last thing he needs is the danger she brings with her. One final mission to the learn the truth. One last hope to save the cause. One way or another, Talbot will find out what’s going on in his city…even though it’s likely to get him killed. Because a life without a cause isn’t worth living, and besides…secret agents aren’t allowed to retire.